Have you ever encountered a situation when you play cards game that you almost have a royal flush. At such a time, do you want to play a magic and get the playing cards you want? When you want to exchange playing cards, smart phone playing cards exchanger is a good choice. This smart phone playing cards exchange tool is suitable for little player game. From the outlook of smart phone, it is no difference from the normal cell phone, but actually there is an interlayer built on it. When you put a playing cards near to the entrance, the playing cards will be pulled in and exchange another playing cards to you. The whole course is no more than 1 second. Just in a flash, no one knows what has happened. 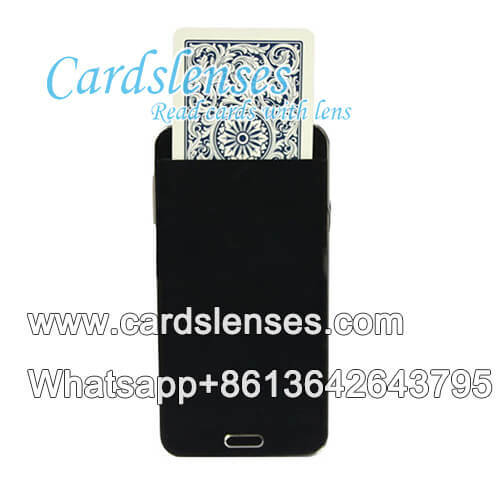 A good quality smart phone playing cards exchanger cannot see the entrance of the interlayer when you put down or pick up the smart phone, even the playing cards inside the interlayer. So, when you buy a playing cards exchanger you can check it in this way.